The new Union Investment index analyses the attractiveness of the top 17 markets. Retail markets worldwide appear to be in good shape at the beginning of 2018. A further increase in optimism among both customers and businesses in almost all investable markets is driving this positive trend. On the downside, higher consumer prices and below-average growth of retail sales are having a negative impact, particularly in Europe. North America – comprising the US and Canada – currently tops the ranking of the most attractive retail regions worldwide, with both markets also showing a strong increase in sales. North America scores 115 points in the new Global Retail Attractiveness Index (GRAI) created by Union Investment, which analyses the environment for retail investment in 17 countries worldwide. The index for North America rose by 10 points over the course of 2017. 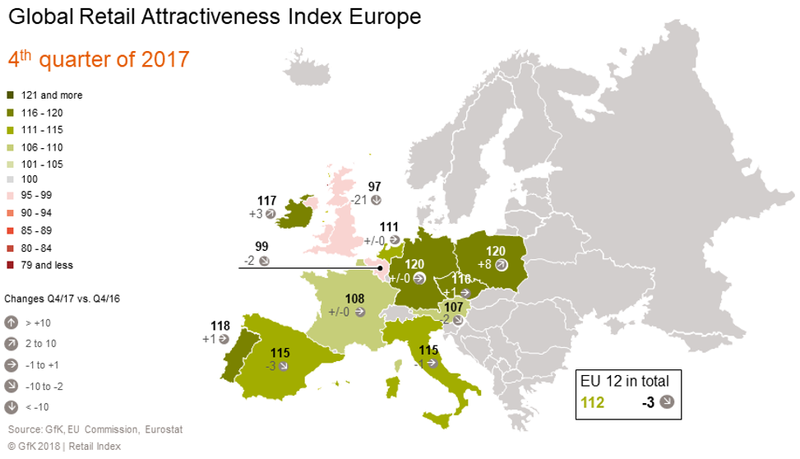 The EU-12 index, which covers twelve European retail markets, declined by three points and currently stands at 112 points, which places it just behind the North America index. The Asia-Pacific index is in similar territory, at 110 points, having gained seven points due to the significantly more upbeat mood among customers and retailers in South Korea and Japan. 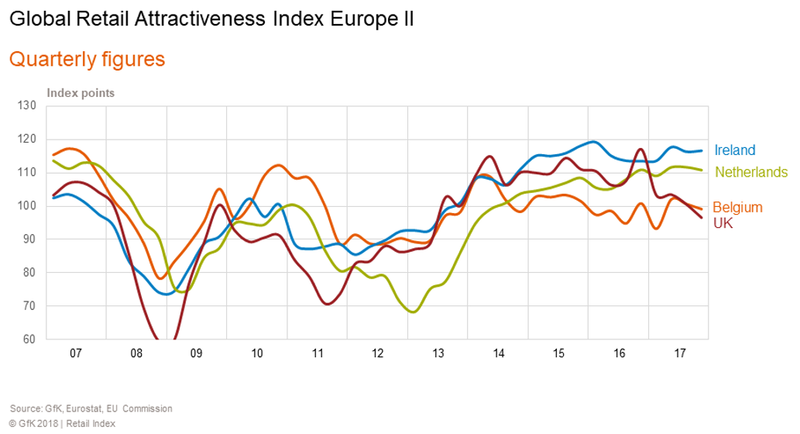 Customer and retailer sentiment improved significantly in all the surveyed regions on the back of a global uptrend, leading to all three indexes now showing above-average values. “Despite both North American markets facing challenges due to a surplus of retail space, they continue to perform well. 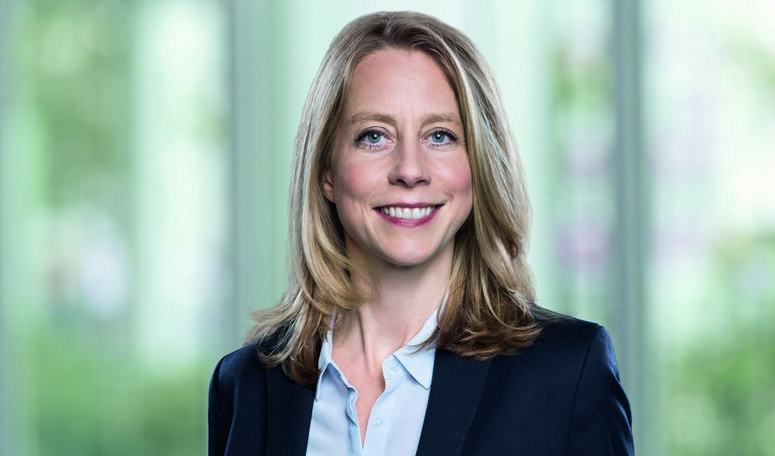 European retail markets, meanwhile, are experiencing vastly divergent developments, some of which are positive and some negative,” said Henrike Waldburg, Head of Investment Management Retail at Union Investment Real Estate GmbH. Germany and Poland in particular, which are the top countries in the European ranking, make a significant contribution to the strong performance of the EU-12 index, scoring 120 points each. Of all the European countries surveyed, the Polish retail market stands out as being the most dynamic, boasting an impressive eight-point increase in the course of last year. Above-average growth of retail sales played a key role here. Portugal is also doing well, coming in third place. This clearly indicates that the country has overcome its massive financial and economic crisis. “Although the Portuguese still have to tackle a few structural issues, sooner or later Portugal will re-appear on investors’ radar,” commented Henrike Waldburg. The second-strongest performance over the course of 2017 was seen in Ireland. 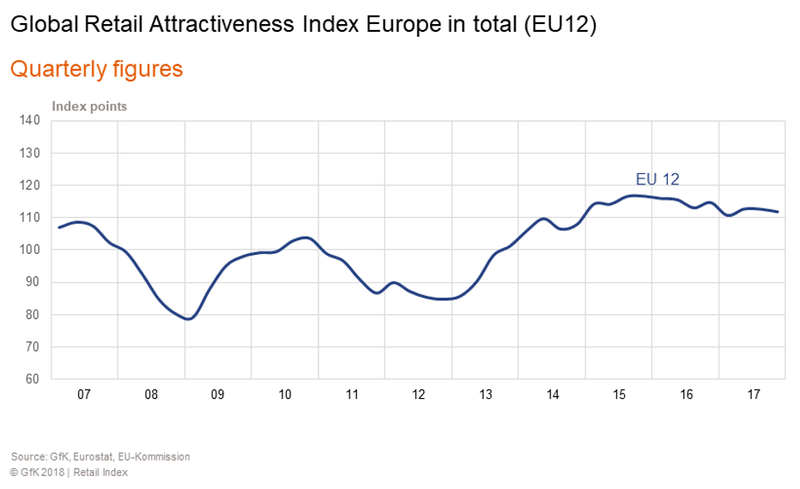 The Irish attractiveness index gained three points in the course of last year. This improvement reflects the positive general trend, particularly in retail sales. The picture is similar in Poland and the Czech Republic. With its 117 points, Ireland joins the top 5, which include Germany (120), Poland (120), Portugal (118) and the Czech Republic (116). The EU-12 index is significantly impacted by the steep fall in the British index. “The uncertainty caused by the discussion around the consequences of Brexit is palpable in the British retail market. Regional British markets are being particularly affected by the lack of clarity. In London, though, the propensity to consume remains high,” said Henrike Waldburg. The Brexit shock caused all four mood and market indicators to decline dramatically over the course of 2017. The British retail index fell by 21 points compared to the previous year. The UK is thus currently at the bottom of the European ranking, scoring just 97 points. 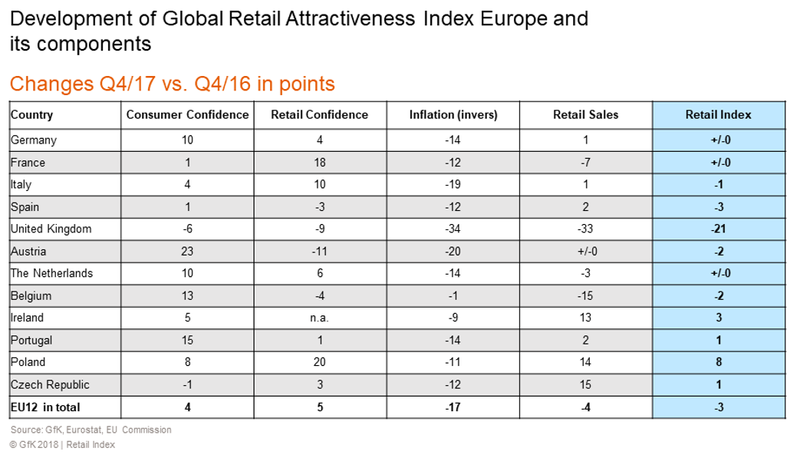 Union Investment’s Global Retail Attractiveness Index (GRAI) measures the attractiveness of retail markets across a total of 17 countries in Europe, North America and the Asia-Pacific region. An index value of 100 points represents average performance. 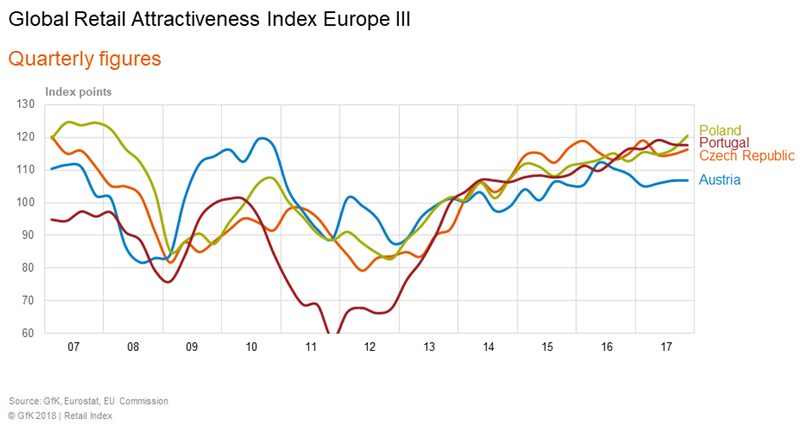 The EU-12 index includes the indexes of the following EU countries, weighted according to their respective population size: Germany, France, Italy, Spain, the United Kingdom, Austria, the Netherlands, Belgium, Ireland, Portugal, Poland and the Czech Republic. The North America index includes the US and Canada. The Asia-Pacific index covers Japan, South Korea and Australia. Compiled every six months by market research company GfK, the Global Retail Attractiveness Index comprises two sentiment indicators and two data-based indicators. All four factors are weighted equally for the index, at 25 per cent each. 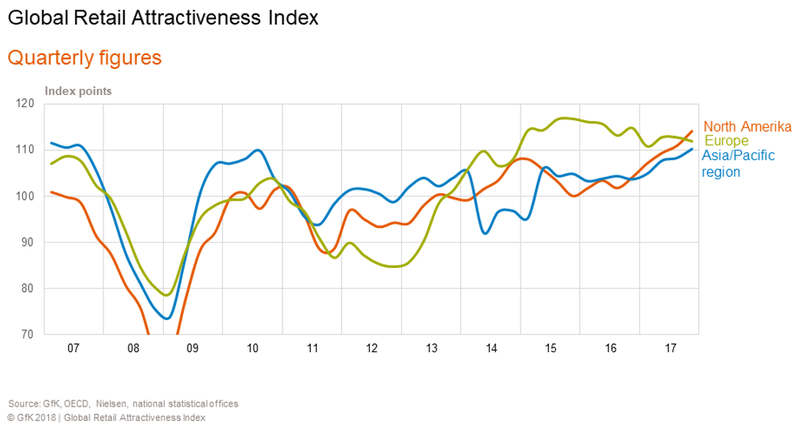 The index includes consumer confidence as well as business retail confidence. The quantitative input factors are changes in the consumer price index (inflation) and sales performance of the retail sector, both of which are incorporated into the GRAI. After standardising and transforming these input factors, they each have an average value of 100 and a possible value range of 0 to 200 points. The index is based on the latest data from GfK, the EU Commission, the OECD, Nielsen, Trading Economics, Eurostat and national statistical offices. 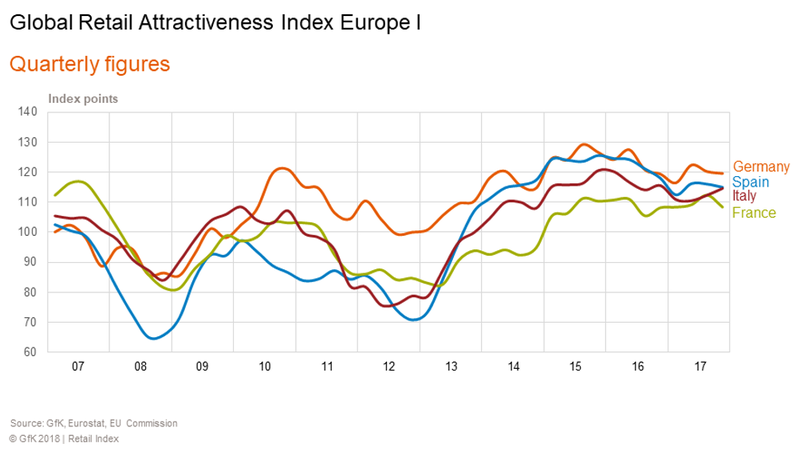 The overall level of the index for Europe in total for the 4th quarter of 2017 was satisfactory. With 112 points It was clearly above average. The good level can be primarily attributed to the currently excellent mood in Europe among consumers (120 points) as well as retailers (121 points). On the other hand, quantitative input factors like inflation (120 points) and retail sales (105 points) are struggling. The Retail Index decreased slightly (by 3 points) over the course of the last year. Particularly the increase of consumer prices past months had a negative impact on the overall index (-17 points). The retail sector only contributed moderately to the decrease of the overall index, with a decrease of 4 points in the subindex. The positive mood on the other hand contributed to the increase with 4 points (consumers) and 5 points (retailers) respectively. On a national level, it is Germany and Poland (each with 120 points), closely followed by Portugal (118 points), who apparently have overcome their financial and economic crises successfully. The United Kingdom is at the end of the list with 97 points. The uncertainty due to the discussions regarding Brexit clearly left its mark. As a result, all four subindexes partially suffered significant losses. Therefore the retail index decreased by 21 points. All other changes are minimal. The winner is Poland with an increase by 8 points. Other EU-countries show only minor changes, ranging from -3 to +3 points. 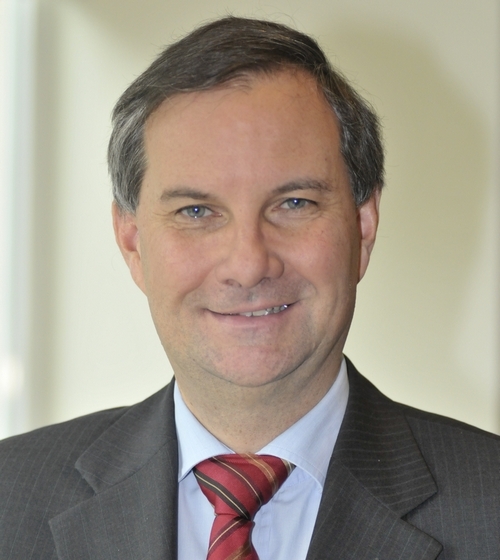 Rolf Bürkl, Senior Manager Consumer Insights at GfK Germany, talks about the new index of Union Investment. ACROSS: Why did you create a new index for the retail real estate sector? Rolf Bürkl: The primary goal was to develop a kind of sentiment indicator for retail properties that makes national markets comparable. It is supposed to indicate whether investments in retail properties in specific countries are promising or not. Due to its uniform design, one can immediately and directly compare countries with each other. ACROSS: How can the shopping center industry and the European retail sector benefit from this index? Bürkl: Both sectors get insights to find out in which countries investments in retail properties are more or less promising. Ultimately, it is about the most efficient allocation of investment resources.